This book introduces a new approach to the analysis and management of growth in small tourism markets for regional and rural locations. It recognizes from the outset that the vast bulk of the tourism industry's product is delivered by small business enterprises and that many of these are located outside of metropolitan areas. Its central premise is that a myriad of small-scale clusters can provide an effective means to establish a local competitive advantage in tourism activities based on the resources of existing communities. The book brings together contemporary views of the potential of clustering theory to promote development in micro-markets, within the paradigm of competition, to create a new framework for regional development that might serve to enhance the growth of small-scale tourism destinations. 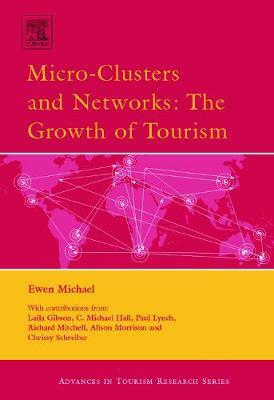 Microclusters and Networks provides a theoretical explanation of how and why micro-clusters come about, with chapters by specialist authors to illustrate examples of their practice in the real world; but it goes further to demonstrate not only why they work but also how community members interact to form successful clusters. The incorporation of networking theory provides the means to explain the role of local community interaction in delivering successful social outcomes. The analysis that is provided clearly has applications for many industries beyond the development of rural and regional tourism destinations. Introduction (Ewen J. Michael); Issues In Regional Development (C. Michael Hall and Ewen J. Michael); Development And Cluster Theory (Ewen J. Michael); Micro-Clusters In Tourism (Ewen J. Michael); The Role Of Networks (Paul Lynch and Alison Morrison); Micro-Clusters: Antiques, Retailing And Business Practice (Ewen J. Michael); Wine Tourism Networks And Clusters - Co-Operation And Barriers In New Zealand (Richard Mitchell and Chrissy Schreiber); Networks: Comparing Community Experiences (Laila Gibson and Paul Lynch); A Path For Policy (C. Michael Hall and Ewen J. Michael); The Contribution Of The Micro-Cluster Approach (C. Michael Hall, Paul Lynch, Ewen J. Michael and Richard Mitchell ).